434, Lot: 5. Closing Dec 12, 2018 at 10:01:40 AM ET. SICILY, Gela. Circa 420-405 BC. Æ Onkia (11mm, 1.10 g, 10h). 434, Lot: 118. Closing Dec 12, 2018 at 10:39:20 AM ET. CILICIA, Tarsos. 164-27 BC. Æ (22mm, 11.77 g, 12h). 434, Lot: 133. Closing Dec 12, 2018 at 10:44:20 AM ET. SELEUKID EMPIRE. Antiochos IX Eusebes Philopator (Kyzikenos). 114/3-95 BC. AR Tetradrachm (27mm, 16.19 g, 11h). Damaskos mint. Dated SE 200 (113/2 BC). 434, Lot: 142. Closing Dec 12, 2018 at 10:47:20 AM ET. NABATAEA. Malichos II, with Shaqilat. AD 40-70. AR Drachm (16mm, 3.44 g, 12h). Petra mint. Dated RY 7 (AD 46/7) . 434, Lot: 164. Closing Dec 12, 2018 at 10:54:40 AM ET. KINGS of MAURETANIA. Juba II, with Kleopatra Selene. 25 BC-AD 24. AR Denarius (16mm, 3.55 g, 6h). Caesarea mint. 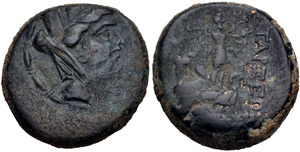 Struck circa 20 BC-AD 24.